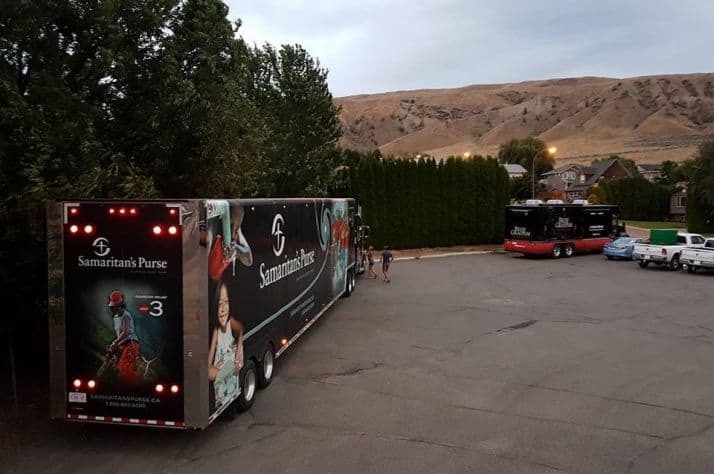 The Samaritan’s Purse Disaster Relief Unit in Ashcroft. The organization was asked to help those on the Ashcroft Reserve and Boston Flats who lost homes. Volunteers from Samaritan’s Purse have been in the area for more than a week, assisting people who lost their homes on the Ashcroft Reserve and at Boston Flats try to find any items that might have survived the fire. “The littlest things we recover for them become the most important things in their lives,” says Greg Schmidt, program manager for B.C. fire response for Samaritan’s Purse Canada. The organization was invited to come here to help residents of Boston Flats and the Reserve, and arrived direct from Vernon, where they spent two weeks doing flood relief work. When they finish in the Ashcroft area during the week of August 7, they will be travelling north to Williams Lake to assist wildfire victims there. Samaritan’s Purse—a Christian relief and development organization—is no stranger to the area. 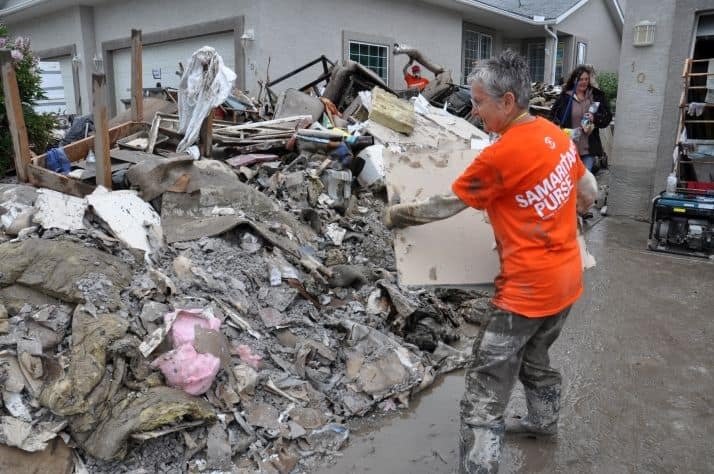 In 2015 SP crew members, along with local volunteers, spent several days in Cache Creek, helping to clean up 17 homes that had been damaged by the heavy flooding in May of that year. Schmidt says that on July 27 he was on a panel at a meeting of Boston Flats residents, where Samaritan’s Purse was asked to take the lead on the possession recovery and ash sifting operation. Crew, along with a specially-equipped disaster relief unit, arrived at the end of July and set up their base at the Sage Hills Evangelical Free Church on the Mesa in Ashcroft. Members of the congregation and other local volunteers and churches provided the crew with a packed lunch and a hot dinner every day (“We’re eating very well!” says Schmidt), and the crew set up cots inside the church. Samaritan’s Purse brings all the equipment necessary to aid in recovery, and trains local volunteers to assist. Schmidt adds that all occupational health regulations are met, with crew members wearing Tyvek suits, respirators, boots, and gloves. While the residents being assisted do not take part in the actual work, they are able to be there to direct the searchers. He says that they found a large amount of jewellery, including someone’s wedding band. They also found pottery and ceramics that had survived the fire, including a teapot with a special story. Crew members who have been working in the area have come from as far away as Nova Scotia, Fort McMurray, and Calgary to help. Also on site was the Billy Graham Association, working in partnership with Samaritan’s Purse.